Hibben Legacy Combat Fighter Knife II With Sheath(GH5072) Gil Hibben knives, collectible knives, throwing knives, hunting knives. Renowned knifemaker Gil Hibben has been designing and producing top quality edged collectibles for more than 50 years. His son, Wesley, has been making and designing custom knives for more than 25 years. For the first time ever, Gil and Wes teamed up to create a priceless collectible - The Hibben Legacy Combat Fighter. Now, United Cutlery and the Hibbens present it with a rich, brown pakkawood handle. The blade is a razor-sharp, 5 7/8" 7Cr17 stainless steel and has a stinging spear point tip and extended piercing tang. 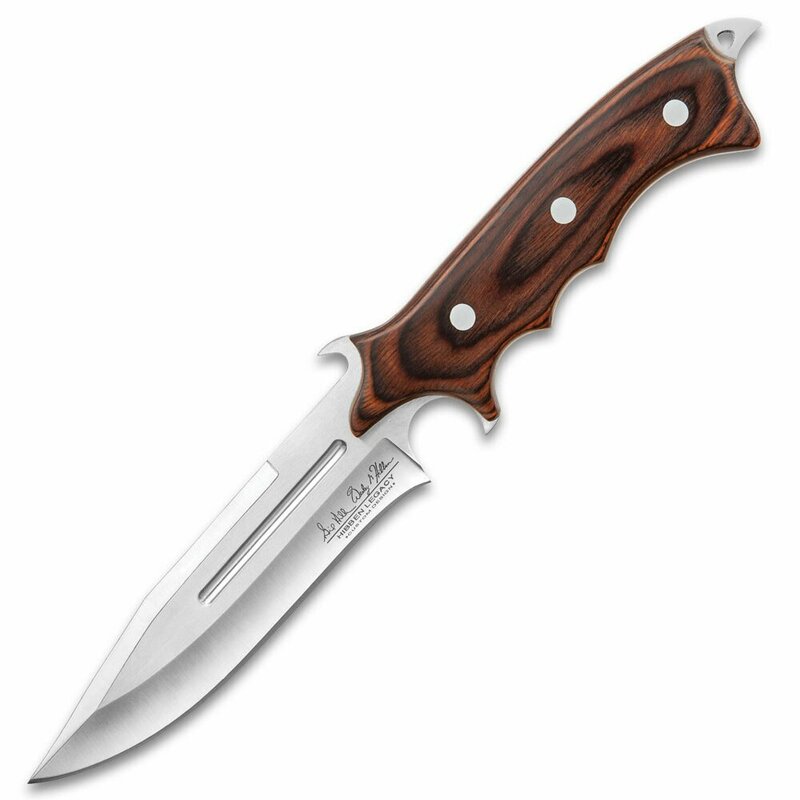 The polished brown pakkawood handle scales wrap the full tang blade for a stylish, smooth grip. A raised thumb rest on the back of the blade and a trigger-finger grip allows for excellent control when wielding this knife. Each blade is laser serialized and etched with Gil and Wesley Hibben’s signatures. The Legacy Combat Fighter II comes in a custom leather sheath stamped with the "Hibben Knives Custom Design Series" logo.